Finally figured it out again, and this time it's perfect. 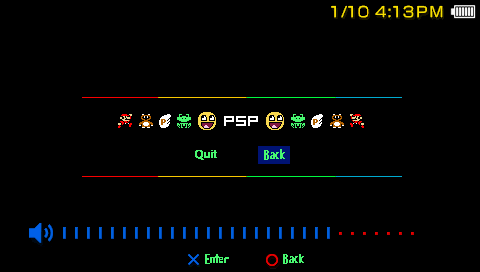 Refreshing to see some psp development, keep it up! 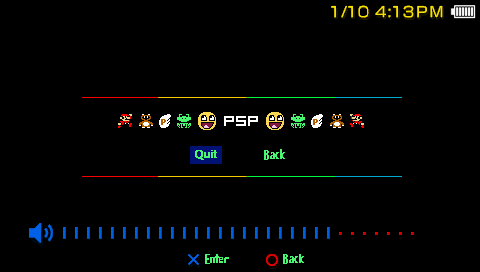 (12/11/2015 10:53 PM)Barcelona Wrote: Refreshing to see some psp development, keep it up! Hey thanks Barcelona! I'll be sure to keep on working! Why not CTF? Why 5.00? Why no screenshots? WHY? (17/11/2015 11:42 AM)Joom Wrote: Why not CTF? Why 5.00? Why no screenshots? WHY? Not CTF it's not a theme it's a custom home screen. 5.00 because that's my current firmware and by far my favorite. Oh, I get it now. "Home" screen, not XMB. Also, if you're planning on serving pirated content on your site, you probably shouldn't go through a free host since you're likely going to get reemed by the DMCA. (17/11/2015 11:59 AM)Joom Wrote: Oh, I get it now. "Home" screen, not XMB. Also, if you're planning on serving pirated content on your site, you probably shouldn't go through a free host since you're likely going to get reemed by the DMCA. Pirated content? Are my themes pirated? Oh do you mean the "Games" section of my site? That's not gonna serve any pirated content (not gonna upload any files if that's what you're thinking) just gonna explain that the PSP can do those things (like DOS Ports, Emulators, PS1 games, PSP Minis and of course PSP games). Maybe write tutorials on how to image PS1 games and then show how to get content off Media Go onto PSP. I'm not looking for any trouble. Oh, well that's fine. I personally don't care what you do with the site. It just wouldn't be wise to do anything sketchy on a free host. (17/11/2015 12:35 PM)Joom Wrote: Oh, well that's fine. I personally don't care what you do with the site. It just wouldn't be wise to do anything sketchy on a free host. Thanks for the heads up Joom I appreciate it. Like I said I'll be keeping stuff pretty clean, especially since it's a free host. That said though, how much does Sony even care about the PSP these days? Are developers even making money off of UMDs anymore?